Anchovy alert ! Based on not-a-few years of cooking classes I’ve done, I now take it for granted that most Americans will simply not even consider the possibility that an anchovy might taste good. An American friend told me many moons ago that anchovies in the USA are synonymous with a surfeit of salt, so I try to appeal to my American friends to at least try an Italian version: which is tasty and savoury and will in not way impair their taste buds. To no avail. Not that it’s a situation I’m not used to – there are people in Italy too who do not appreciate the subtlety of the umami taste afforded by an anchovy – which is why I enquire beforehand with my guests when frying mozzarella-stuffed courgette blossoms. But if, very broadly speaking, in Italy the nay-sayers are two out of ten, the percentage rises up to eight out of ten when it comes to North Americans. Whatever. As I write, I am nodding my head in the direction of dear friend, wonderful cook and anchovy despiser Phyllis Knudsen (http://oracibo.com/) and saying: yes, yes, yes, all right – the following recipe should probably taste all right even without the anchovy. Chef Filippo La Mantia (http://www.filippolamantia.com/en/filosofia.html) was formerly a photographer, and very good looking too. My family and I had a lovely dinner at his former restaurant in Rome (he since moved to Milan). And he was most aimiable and charming as well. 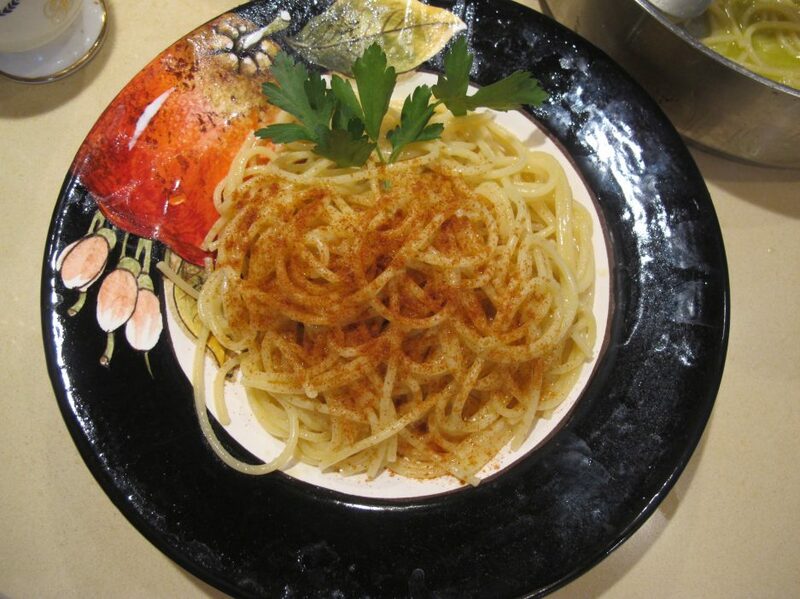 His obsession, if we want to call it such, is not the anchovy but instead … garlic and onions. The guy will simply NOT consider them in any of his preparations. So, you see, to each his anchovy or allium own. I follow Kay Gale’s blog with great enjoyment (see link below) and only the other day read about a recipe that was very similar to one I made last week. Both recipes called for cooked aubergines, capers, chilli, mint and lemon. I frankly didn’t have any capers to hand that day and so had to do without. I followed the instructions as much as I could but next time will grill the aubergines instead of cooking them in salted water. First slice the aubergines and simmer them in salted water for 3-4 minutes. Easy enough. Then remove and place them over kitchen paper which rests on a clean tea towel below it (it’s not possible to see in this photo but trust me – there was indeed a nice fresh tea towel to absorb all the extra moisture). While the slices were drying off, I made an emulsion with olive oil and lemon juice. I patted the slices dry and changed the paper until I thought that was the best I could do. I transferedd the aubergine to a large plate and scattered mint and origano over them. This was followed by some bits of chilli here and there, and anchovy fillets here and there, salt, and finally the citronette, the olive oil and lemon juice dressing. It was actually pretty nice, even without the capers. I expect it’s the sort of summer salad that tastes even better the next day, so good for gatherings and parties. Great as a bruschetta topping too.